“It is the most beautiful of our butterflies that I have seen,” wrote Thaddeus W. Harris in the mid-1800’s, referring to the Red-spotted Purple form of Limenitis arthemis. 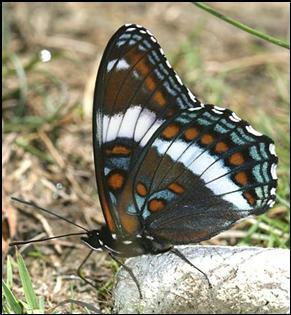 The two distinct phenotypes of Limenitis arthemis, the southern-based Red-spotted Purple (non-banded) and the northern-based White Admiral (white banded), occur in Massachusetts. The two forms were long treated as separate species, and they are sufficiently differentiated that most authors today refer to them as subspecies. The state is in the blend zone between these two venerable forms, so that many intergrades (“hybrids”) are also found here. The North American Butterfly Association recently proposed the name Red-spotted Admiral to refer to the species as a whole. Butterflies in the genus Limenitis, which in our area includes the Viceroy, are mimics par excellence. The Viceroy mimics the Monarch (even though both are distasteful to bird predators), while the Red-spotted Purple mimics the toxic and protectively-colored Pipevine Swallowtail. The White Admiral, on the other hand, is a non-mimic; its bright white band deters predators through disruptive coloration, breaking up the true outline of the wings. The Limentis butterflies as a group present a fascinating study in the effects of natural selection related to mimicry on varying phenotypes. It is thought that an ancestor of our White Admiral, possibly the Paleoarctic White Admiral (Limentis populus), now found across Eurasia to Japan, entered North America sometime before the last period of glacial advance, and became the progenitor of present-day Limenitis species (Platt 1983). The Red-spotted Purple evolved to survive in more southerly areas by mimicking the Pipevine Swallowtail. Genetic and other evidence supports the view that mimetic and non-mimetic Limenitis populations persisted in geographically separated refugia during the period of glacial expansion, and that today’s blend zone across southern New England, New York, Pennsylvania and the upper mid-west is a result of post-glacial population expansion and secondary contact (Mullen et al., 2008). Mullen writes that “Taken together, the phenotypic, genetic, biogeographical and paleoclimatic evidence all suggest that current hybridization between L. a. astyanax and L. a. arthemis represents relatively recent secondary contact between already divergent lineages (Mullen et al. 2008: 1412).” The White Admiral and Red-spotted Purple are evolutionarily distinct, genetic divergence is substantial, and gene exchange is only intermittent. The phenotypic (wing-pattern) and other differences between the two are maintained by continuing differences in natural selection pressures related to bird predation. The two forms may have been at some point evolving toward separate species, but today are not fully reproductively or ecologically isolated. Massachusetts lies just north of the breeding range of the Pipevine Swallowtail, which is not here in sufficient numbers to reinforce the advantage conferred to its mimic, Red-spotted Purple. (See Ries and Mullen 2007 for abundance maps derived from NABA Counts.) The state is thus in a blend zone between the White Admiral and the Red-spotted Purple; both phenotypes coexist here. This context also allows many intergrade phenotypes to persist. Two named intergrades found in the literature are var. prosperpina, with only a trace of a white band, and var. albofasciata, which has a larger white band, but still not the full band of the White Admiral. The form rubrofasciata is a White Admiral with more red both above and below than the eastern White Admiral; it is found mostly in western Canada, but has been found in Minnesota and Wisconsin. Some rubrofasciata-like specimens have even been found in northern New England (A. Grkovich, NELeps, 8/17/2011). For thumbnails comparing L. arthemis rubrofasciata with L. arthemis arthemis, see http://butterfliesofamerica.com/t/Limenitis_a.htm . Today it is clear that there is a great variety of Limenitis intergrades, and distinguishing between them may be a daunting task. Many of these forms do have particular genetic bases (Mullen, pers. com. 8/16/2011), but the range of variation of each form has yet to be precisely described or explained. Examples of Massachusetts intergrades are plentiful. For photos of a Red-spotted Purple with red spots on the dorsal hind wing (Topsfield, 7/30/2002, F. Goodwin), a Red-spotted Purple with traces of white banding (Tom Swamp Petersham 6/19/2005, F. Model), and a White Admiral with dorsal red spots (6/30/07 Quabbin, F. Model), see the MBC website at http://www.naba.org/chapters/nabambc/construct-group-page.asp?gr=Nymphalidae Another Red-spotted Purple with traces of white banding (Lenox, Massachusetts 18-VI-1960) may be seen at http://butterfliesofamerica.com/limenitis_arthemis_astyanax_specimens5.htm For out-of-state photos of White Admirals illustrating the presence/absence of red spots on the dorsal hind wing, rubrofasciata red band on dorsal hind wing, and varying degrees of expression of the white band, see http://butterfliesofamerica.com/limenitis_a_arthemis_specimens.htm , as well as the specimens2 and specimens3 pages. The hybrids page illustrates a Viceroy/Red-spotted Purple hybrid. Both forms of Limenitis may have at first increased in abundance after 1600 as a patchwork of small farms resulted in an increase in early successional and edge habitat. But they must have decreased somewhat when clearing for agriculture reached its peak in the mid-1800s (Table 1), and then rebounded with the re-growth of woodlands and wooded suburbs after 1850 (Table 2). Perhaps the earliest known Massachusetts specimens of the Red-spotted Purple are in the collection of Thaddeus W. Harris. He first collected it near Boston (probably in Milton) in late June 1820, then raised the species in 1822-23, and collected another specimen in Cambridge on June 25, 1838 (Harris Collection MCZ, n.d. List, and 1822-50 Index). Scudder collected what is probably one of the earliest Massachusetts specimens of White Admiral in Williamstown, shortly after he had enrolled at Williams College in 1853, at age 16, and began roaming the surrounding field for butterflies, inspired by other Williams students who followed the same pastime (Leach 2013: 34). Scudder treats the two forms as separate species, and by 1889 gives no list of localities for the Red-spotted Purple, simply saying that it was “tolerably abundant” in southern New England, and "not rare" in Williamstown, Massachusetts (1889: 284-5). It was probably collected by almost all early lepidopterists in the state. F. H. Sprague, for example, collected specimens of both Red-spotted Purple and White Admiral at Wollaston (now Quincy, Boston) in 1878: singles of White Admiral on 29 June and 3 July, and many specimens of Red-spotted Purple: June 19 (2), 20, 25, 29 (2), July 1 (2), and July 3. In the western half of the state he collected Red-spotted Purple in Belchertown on the 8 and 10 July and Leverett on July 20 and 23 (Sprague 1879; some of these specimens are in the Harvard MCZ). Farquhar (1934) gives a long list of locations from which Red-spotted Purple and various intergrade forms had been collected, in both western Massachusetts (e.g. Bashbish Falls, Chester [1911 specimen at Boston University], and Deerfield) and eastern, including Woods Hole on Cape Cod. At the Harvard MCZ, pre-1930 wild-caught specimens exist from Amherst, Belchertown, Holyoke, and "Berkshire County" in western Massachusetts, and Hudson, Malden, Milton, Natick, Sherborn, Tyngsboro and Wellesley in eastern Massachusetts. The large number of specimens taken on Martha’s Vineyard by F. M. Jones between 1940 and 1949 (and two dated 1920) more than amply document the presence of the Red-spotted Purple form on that island (Yale Peabody Museum). However, the species was apparently not present on Nantucket at that time. Jones reports that the host plant on the Vineyard was, as on the mainland, black cherry. He also reports seeing several local specimens with "more or less distinct traces of white bands crossing one or both pairs of wings, in extreme instances taking the form of clearcut broad bands crossing both pairs...." He referred to these as either albofasciata or proserpina forms, but from the description some might very well have been White Admirals (Jones and Kimball 1943:32-33). Scudder does list locations for the White Admiral form, noting from his own experience that was not uncommon in the Berkshire Hills at Williamstown, and that it had been taken sparingly at Deerfield, Amherst, South Hadley, Belchertown, Holyoke and Templeton. Nor was it unknown in eastern Massachusetts, having occasionally been found near Boston at Dorchester, Malden, Wollaston, and Walpole (Scudder 1889: 299). By 1934 additional White Admiral locations are listed by Farquhar: for western Massachusetts he lists Mt. Greylock and New Lenox; at Boston University and at the Harvard MCZ are specimens taken by C.W. Johnson from Mt. Greylock (7/22, 24, 25/1917), New Lenox (7/24/1917), and Chester (8/4/11). For eastern Massachusetts Farquhar lists Marblehead, Salem, Cambridge, Malden, and Nonquitt (south coast Bristol Co.; August 1894). It is clear that White Admiral was historically not rare, but probably just uncommon, in eastern Massachusetts. 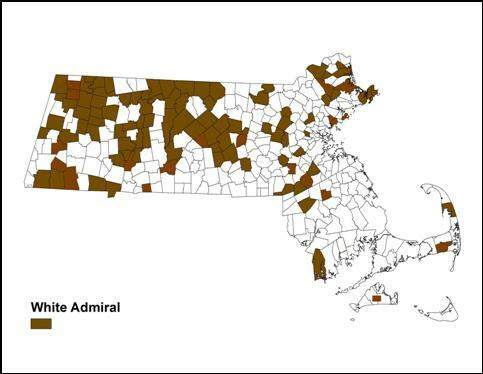 However, there are apparently no White Admiral reports from Cape Cod prior to 1994 (see below under State Distribution). In central Massachusetts, intergrades may have been more common than either of the two pure forms. A major early twentieth century collector, William T. M. Forbes, wrote that “The majority of astyanax? I have caught at Worcester show traces of arthemis characters, such as a bit of white band below, or red spots on the hind wing above (Forbes 1909).” Today, there are few studies of the relative abundance of various forms in particular areas. However, good information comes from an eleven year study in the 1980's of Limenitis arthemis populations in Shutesbury (Franklin Co.) by Austin P. Platt. Of the large number of wild-caught specimens examined, 42% of the individuals were partially banded ("proserpina" intergrades), 40% were unbanded (Red spotted Purples), and 18% were banded (White Admirals), (Platt 1983, Fig. 7; also cited by Cassie, MAS Atlas). At least 82 of the huge number of specimens taken from the wild for this Shutesbury study now reside in the Yale Peabody Museum. Massachusetts observers report Red-spotted Purple ovipositing on black cherry in the wild (e.g. Georgetown Crane Pond WMA 7/26/2008, S. and J. Stichter), and have raised it on black cherry and ornamental cherry. Caterpillar photographer Sam Jaffe finds Red-spotted Purples predominantly on black cherry in eastern and central Massachusetts, but also sometimes on crabapple (Jaffe 2009). Mello and Hansen (2004) report that black cherry is the most commonly used host plant on Cape Cod, although scrub oak might be a possible host there. Matt Arey has observed ovipositing on both black cherry and chokecherry (P. virginiana) (Topsfield 8/16/2006), and, interestingly, Matt Pelikan reports ovipositing on shadbush (Amelanchier canadensis) on Martha’s Vineyard (Oak Bluffs, 6/20/2011). The 1990-95 Connecticut Butterfly Atlas reports finding Limenitis arthemis larvae on cherry, willow, aspen, scrub oak and red oak, but did not differentiate between White Admiral and Red-spotted Purple (O’Donnell et al. 2007). The full list of Red-spotted Purple host plants includes not only black cherry but also pin cherry and chokecherry (Prunus pennsylvanica and virginiana), apples (Malus spp. ), plums (Prunus spp. ), black oak and scrub oak (Quercus velutina and ilicifolia), hawthorns, hornbeams, gooseberry, and many different aspens (Opler and Krizek 1984; Scott 1986). Willow (Salix spp.) is a possibility. White Admiral larvae, on the other hand, as noted, prefer sweet birch (Betula lenta), yellow birch (B. alleghaniensis or lutea), and aspens (Populus spp. ); they also feed on American basswood (Tilia americana), American hornbeam (Carpinus caroliniana), hawthorns (Crataegus spp. ), and shadbushes (Amelanchier spp.) (Opler and Krizek 1984). They are reluctant to use cherry. There is also a habitat difference between the two subspecies. Red-spotted Purple is most often found in and near deciduous or mixed woodlands, both moist and dry, including thin coastal plain woodlands and their edges, whereas the White Admiral prefers northern or even boreal deciduous or mixed woods dominated by birch or aspen. Both subspecies also visit parks, gardens and orchards. In MBC records, Limenitis arthemis is reported as either Red-spotted Purple, White Admiral, or (least frequently) Red-spotted Admiral. Sight observers have generally not distinguished any intergrades: a sighting is assigned to whichever main form it most resembles. In Tables 5 and 59, and in Charts 59A and 59B below, only those sightings reported as Red-spotted Purple or as White Admiral have been used. Those reported as Red-spotted Admiral have been omitted. According to MBC sightings 2000-2007 (Table 5), the Red-spotted Purple form ranks as Uncommon-to-Common in Massachusetts, while the White Admiral form is Uncommon. Over the 18 years shown in Charts 59A and 59B, there is a downward trend in the sightings per total trip report for both the Red-spotted Purple and the White Admiral; decline is particularly strong for White Admiral. (The Breed et al. 2012 list-length study of abundance trend unfortunately did not include this species.) In addition, there are two noticeable two-year “boom” periods, which are the same for both subspecies. The years 1994 and 1995, and 2003 and 2004, had markedly more sightings per total trip reports. The booms last for two years owing to the life cycle of the butterfly, which over-winters as a partly-grown larva, emerging to finish growth and fly the following spring. The large number of sightings in 1994-95 is to a certain extent due to rather large numbers reported from the Franklin and Berkshire County towns of Heath, Monroe, Peru, Rowe and Savoy by D. Potter in 1994-5; these are independent of the NABA Counts. The numbers reported by Potter from these areas do decline in 1996, 1997, and 1998, but after that year there are virtually no reports and no trips from any observer for these towns, somewhat skewing the results in Charts 59 A and B. Still, the pattern of peaks and valleys shown in these charts is given further support by the raw numbers reported from the Northern Berkshire NABA Count, shown in Table 59. On this count, both Red-spotted Purples and White Admirals are usually seen every year. Especially large numbers were seen in 1994 and 1995, and again in 2004. Declines since 2004 are evident for both species, but most markedly for White Admiral. Numbers of count participants remained roughly the same, or increased. Additional evidence that the relative abundance trend for both forms has been down since 1994 comes from statistics published in Massachusetts Butterflies, which give the percent change in average number seen each year compared to the rolling average for preceding years back to 1994. For Red-spotted Purples, the average number seen was down 28% in 2010, down 51% in 2009, and down 34% in 2008 compared to the average for preceding years. Similarly, for White Admirals, the average number seen was down 65% in 2010, 77% in 2009, and 45% in 2008 compared to the average for preceding years. Frequency of reports of Red-spotted Purple and White Admiral, and the maximum number seen on a trip, were also down (Nielsen, 2009, 2010, 2011). These downward slides in two popular and easily identified butterflies are worrisome. The Red-spotted Purple (and intergrades which resemble it) occurs about equally in all regions of the state. It may be a bit less common in Berkshire County than elsewhere, with the White Admiral correspondingly more common, but MBC sightings, 1986-90 Atlas data, and museum specimens amply attest to its presence there. It is found almost every year on each of the three Berkshire County NABA counts ( Southern, Central, and Northern), and there are many reports from such towns as Sheffield, Egremont, Tyringham, Pittsfield, Lee October Mountain State Forest, Cheshire, Savoy, Mt. Greylock (many reports), Windsor and Williamstown. 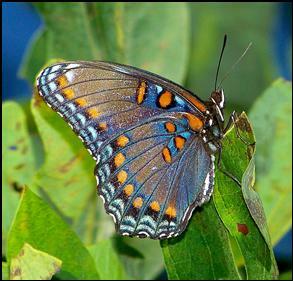 At the other end of the state, Red-spotted Purple was first reported from Nantucket during the Atlas period. The first record is a sight report by W. Maple, 6/26/1987, at Siasconset, as part of the MAS Atlas. There is also a 14 July 1988 specimen by W. Maple in the Maria Mitchell Museum (LoPresti 2011). It had not been reported historically (see above). The species may have come over from Martha's Vineyard, since its host tree black cherry had been present on both islands for some time. Since then, Red-spotted Purple has been reported from the island of Nantucket in 2013, 2012, 2011, 2008 (see photo above), 2005, 2003, and 1989. A bit of an island-hopper, Red-spotted Purple has also been found on Gosnold Cuttyhunk (2003 and 1986); Nahant (2003 and 2010), and the Boston Harbor Islands (1990 and 2000: e.g. Peddock’s Island, 1, 6/10/2000 B. Cassie). For Martha's Vineyard, there are many MBC and Atlas reports, from the towns of Chilmark, Edgartown, Oak Bluffs, Tisbury and West Tisbury. The Vineyard checklist ranks it as "common" (Pelikan 2002). One of the intergrades, form albofasciata (thin white line fully across the wings) has been reported from Oak Bluffs (1, 8/23/2001, M. Pelikan). The White Admiral (and intergrades which resemble it) is more common in the western part of the state. What may be surprising is that it has been found, sparingly, in southeastern Massachusetts, and even on Martha's Vineyard. Map 59 shows all towns from which there is at least one White Admiral report in BOM-MBC records. White Admiral has been found in 104 out of a possible 315 towns in this period. The occasional appearance of White Admirals in unexpected southern locations, such as Cape Cod, Westport or the Vineyard, is quite possible, and is not necessarily the result of long-distance migration. The White Admiral’s white band is a recessive genetic trait which may appear in any population, even one completely isolated from nearby White Admirals (Cech 2005, citing Platt and Allen, 2001; Iftner et al. 1992: 137) However, White Admiral’s persistence in these areas is probably limited by climate and ecotone. White Admiral has not been reported from Nantucket, but a few near-forms have been historically reported for the Vineyard (see above). White Admiral has been recently reported once from Martha’s Vineyard (1, 9/21/2000, V. Laux); but no town was given, so this report is noted by a dot on Map 59. The first White Admiral documented for Cape Cod was found among 10 Red-spotted Purples by Tor Hansen on Griffin Island in Wellfleet on August 13, 1994 (Mello and Hansen 2004: 50, 86, Plate 10; LepSocSeasSum 1994). This individual was photographed by Tor Hansen; it had no “intergrade” characters, that is, no red spots on the dorsal forewings or hindwings (see photo in Mello and Hansen 2004). Hansen also reports White Admiral from Crane WMA in Falmouth, but no date is given. Recently, a White Admiral was found in Harwich on 7/23/2011 as part of the Brewster NABA Count. The White Admiral form is still rare on Cape Cod. West of the Cape, White Admiral has been reported very rarely along the south coast, only two reports in over 100 years: Nonquitt (in south Dartmouth) August 1894, Caroline Soule (1); and Westport Horseneck Beach 9/7/2002 B. Bowker (1). The 1986-90 MAS Atlas found no White Admirals in Bristol or Plymouth counties, or on Cape Cod, Martha’s Vineyard, or Nantucket (MAS Atlas records). On the Bristol County NABA counts from 1988 through 2012, only Red-spotted Purples have been reported. The White Admiral is found fairly often in Essex County north of Boston, but always as single individuals. BOM-MBC records show reports from Boxford (2010), Gloucester, Groveland, Haverhill, Ipswich (2009), Lynn (2009), Marblehead (2011), Middleton, Newbury (several reports), Newburyport, Rockport and Topsfield. The MAS 1986-90 Atlas found it in Georgetown, Gloucester, Newbury and Topsfield. Many intergrades also occur in Essex County (e.g. 7/30/2002 photo by F. Goodwin on MBC website; sight report 8/1/2007 Martin Burns WMA, S. Stichter). The MBC flight chart from 1993-2008 records shows that Red-spotted Purple/White Admiral flew in this period mainly from the last week in May through mid-September: http://www.naba.org/chapters/nabambc/flight-dates-chart.asp The White Admiral form begins flying somewhat later than the Red-spotted Purple form. Both Red-spotted Purple and White Admiral have two broods. Most of the offspring of the first brood feed until half grown and then hibernate over the winter in a hibernaculum (similar to the Viceroy). Some larvae, however, develop fully during the summer, pupate, and then emerge as a small, secondary brood in late summer. Butterflies from this late season partial brood may mate in time for their offspring to develop into over-wintering larvae (most Red spotted Purples), or time and cold weather may prevent their larval survival (most White Admirals). MBC statewide sight data do not show a clear time break between the different broods. Earliest sightings: In the twenty-three years of BOM-MBC data 1991-2013, the six earliest "first sightings" of Red-spotted Purple were 5/3/1998 Holliston R. Hildreth; 5/15/2013 Holliston R. Hildreth; 5/16/2000 Wenham F. Goodwin; 5/17/2010 Mt. Tom C. Kamp; 5/18/1996 Hopedale T. Dodd; and 5/18/2003 Topsfield F. Goodwin. This species was seen in one year in the first week of May, in no years in the second week, and eight years in the third week of May. In the remaining 14 years, the first Red-spotted Purple was seen in the last week of May or in early June. The Red-spotted Purple may be starting its first flight period markedly earlier than a century ago. Scudder (1889: 286) wrote that “the butterflies appear in the southernmost parts of New England (and probably in the Connecticut valley), from the 5th to the 10th of June, though only in limited numbers; in the latitude of Boston they seldom appear before the 18th or 20th, and they do not become abundant before the close of the month. Noted collector F. H. Sprague said the Red-spotted Purple first appeared in Wollaston on 19 June 1878, and the White Admiral not until the 29 of June that year (Sprague 1879). The White Admiral usually appears a bit later than the Red-spotted Purple. In the same twenty-three years of BOM-MBC data 1991-2013, The five earliest "first sightings" are 5/24/2010 Sunderland C. Kamp; 5/31/2009 Whately B. Benner; 6/1/1998 Groveland J. McDougall, 6/1/2011 Sudbury, S. Moore and B. Volkle; and 6/1/2012 Mt. Greylock, G. Dysart. More of the early sightings have been in recent years, and in particular the warm springs of 2010 and 2012 may have affected this species. In two of the 23 years (2010 and 2009) the first White Admiral was seen in late May, in seven of the years the first one was seen in the first week of June, and in the remaining 14 years the first White Admiral was not reported until either the third or the fourth week in June. Scudder’s observations on White Admiral flight times were made mostly in the White Mountains of New Hampshire, and thus are not applicable to Massachusetts. In the mountains the first brood usually appeared “from the 16th to the 20th of June” (1889: 303). However, Sprague’s date of Jun 29 for Wollaston, noted above, is similar to today’s first sighting dates in Massachusetts. Scudder did cite evidence of the second, less numerous, White Admiral flight in Massachusetts, occurring in August. F. H. Sprague had taken fresh specimens, both male and female, in South Hadley on August 7, and in Deerfield on August 17 (1889: 303). Latest sightings: In the twenty-three years of BOM-MBC data 1991-2013, the five latest "last sightings" of Red-spotted Purple were 10/6/1993 Gloucester, D. Savich and C. Tibbits; 9/30/2011 Newbury, S. Stichter; 9/25/2003 Oak Bluffs, M. Pelikan; 9/24/2008 Tisbury, M. Pelikan; and 9/24/2006 Danvers, M. Arey. Thus, in only one year was Red-spotted Purple seen flying in October. (However the 1986-90 MAS Atlas reported one October sighting: 10/1/1988, W. Stockbridge, E. Dunbar). In five of the twenty-three years the latest sighting was in the last week of September or later, in six years it was in the third week of September, and in the remaining 12 years the last sighting was in early September or late August. Flying into September seems to be par for the course for this species; Scudder also reported Red-spotted Purples flew “through the month of September (1889: 286). There is no evidence of any “lengthening of the flight tail” since Scudder. Seven out of 23 last sightings were on Martha’s Vineyard. The Red-spotted Purple second brood generally flies later than the White Admiral. In the 23 years under review, the four latest White Admiral "last sightings" in the records are 9/29/1998 Heath D. Potter; 9/23/1999 Royalston C. Kamp; 9/21/2000 Martha's Vineyard, V. Laux (possibly an intergrade); and 9/21/2003 Mt. Tom T. Gagnon. In eleven of the twenty-three years, there were no White Admiral reports in September, the last sightings being in August or even July. So in some years there may be no or only a very small, unnoticed second brood of White Admirals. According to historical reports, there is usually a second flight, lasting into September even in the White Mountains (Scudder 1889: 303). Both subspecies of this lovely butterfly have adequate habitat in Massachusetts today. Red-spotted Purples and White Admirals are not among our most common butterflies, but they are not rare either. The major threat they face is climate change, as a strong warming trend might induce White Admiral range contraction northward (Table 6). Massachusetts is at present at the southern edge of White Admiral’s range (see map in Cech 2005). Given the substantial genetic, host plant, habitat and range differences between the two subspecies of Limenitis arthemis, L. a. arthemis and L. a. astyanax, conservation status assessments should distinguish between them rather than lumping them together. At present, for example, NatureServe ranks Red-spotted Admiral as S5 or secure in Massachusetts, but White Admiral, considered separately, could very well deserve a less-secure designation.